By Keith Cowing on June 9, 2015 7:59 PM. 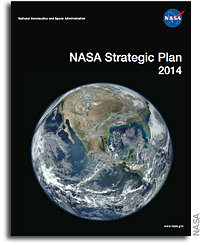 "I recently examined the latest NASA Strategic Plan, and I was disappointed that it hardly resembled a plan at all. It reads and feels like a slick year-in-review annual report from a national charity organization. The vision statement reads, "We reach for new heights and reveal the unknown for the benefit of humankind." And the mission reads, "Drive advances in science, technology, aeronautics, and space exploration to enhance knowledge, education, innovation, economic vitality, and stewardship of Earth." There are photographs of STEM outreach to schoolkids and lots of interesting "pieces," but there's a lack of a credible coherent vision and mission. The plan seems vaguely aspirational, and does not seem to reflect the basic political and funding realities of a fragmented Congress battling with the White House, or the competing internal interests perceived by other federal agencies." "This thing reads like an annual report - there is no "plan" in this strategic plan. The authors are utterly confused as to what a "goal", "objective", and "strategy" are and confusingly use the terms interchangeably. It is almost as if they say "it is important that we do what we are doing because we are already doing it". Also, doing things in a cost-effective and innovative way seems to be some sort of strategic objective preoccupation with the reports' authors. Well, DUH, you should always do such things in a cost-effective and innovative way as a matter of course in ANY project - government or otherwise - not do so as an end in and of itself." "And now GSFC has taken the time to develop a plan to implement this confusing non-strategic non-plan. I can't wait to see how they measure their progress." A Grand National Space Strategy Could Save NASA (Op-Ed), Michael Potter, Space.com\n\n\"I recently examined the latest NASA Strategic Plan, and I was disappointed that it hardly resembled a plan at all. It reads and feels like a slick year-in-review annual report from a national charity organization. The vision statement reads, \"We reach for new heights and reveal the unknown for the benefit of humankind.\" And the mission reads, \"Drive advances in science, technology, aeronautics, and space exploration to enhance knowledge, education, innovation, economic vitality, and stewardship of Earth.\" There are photographs of STEM outreach to schoolkids and lots of interesting \"pieces,\" but there's a lack of a credible coherent vision and mission. The plan seems vaguely aspirational, and does not seem to reflect the basic political and funding realities of a fragmented Congress battling with the White House, or the competing internal interests perceived by other federal agencies.\" \n\nNASA's Strategic Plan Isn't Strategic - or a Plan, earlier post\n\n\"This thing reads like an annual report - there is no \"plan\" in this strategic plan. The authors are utterly confused as to what a \"goal\", \"objective\", and \"strategy\" are and confusingly use the terms interchangeably. It is almost as if they say \"it is important that we do what we are doing because we are already doing it\". Also, doing things in a cost-effective and innovative way seems to be some sort of strategic objective preoccupation with the reports' authors. Well, DUH, you should always do such things in a cost-effective and innovative way as a matter of course in ANY project - government or otherwise - not do so as an end in and of itself.\"\n \nMore NASA Strategic Plan Vaporware, earlier post\n\n\"And now GSFC has taken the time to develop a plan to implement this confusing non-strategic non-plan. I can't wait to see how they measure their progress.\"
This page contains a single entry by Keith Cowing published on June 9, 2015 7:59 PM. LightSail Deploys Its Sail was the previous entry in this blog. This Week's Semi-Regular Stealth Mars Briefing is the next entry in this blog.